Great location next to the airport and offering free car parking. The local Train Station is only half a mile away ( Squires Gate ). There is a good on-site restaurant serving great value fresh meals throughout the day. Local attractions include the beach and pier which are less than 1 mile away and the zoo winter gardens, and famous Blackpool Tower are just a 10 minute drive away. 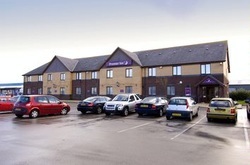 Book direct for the best Premier Inn Blackpool Airport deals.